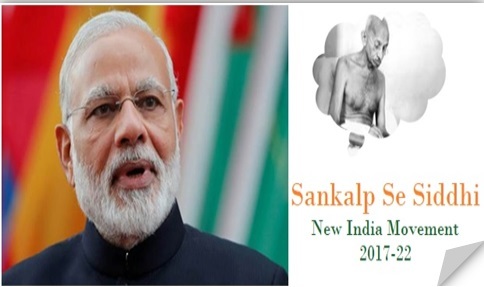 The central government has introduced a new Scheme termed as Sankalp Se Siddhi Yojana. The new scheme has been introduced with an aim to benefit the nation. The central government aims at looking into all matters related to the economic and social welfare of the nation. It is certain that the government has announced the new scheme as a five year plan starting from 2017. Under this scheme it is certain that the central government aims at introducing a number of policies and other related schemes for benefiting Indian citizens. Activity And Events : The government will organize a number of social activities and events under the scheme. By running these programs the government will make people aware of issues related to the country concerning social developments. Raising Issues: The government also aims to raise a number of issues under this program including hygiene, education, poverty, caste, discrimination and religion. The government aims to eliminate these issues completely by implementing this scheme thus offering benefit to the people of India. The scheme is introduced to help the people belonging to the lower income category to help them increase their earnings including farmers. The government shall provide with solutions to help them double their income by the year 2022. The program will also facilitate Tribal families to generate more income annually. The Farmers and Agricultural welfare shall be organizing the campaigns and events nation wide starting from 19th to 31st Aug (current year). It is certain that over 53 ATMA’s, 578 KVKs (Krishi Vigyan Kendra) and 29 SAU’s or ICAR institutions will be involved in implementing the events. At the time of the launch of the program the authorities had also shared a short movie clip with others. There were over 33 MLA’s and MPs who had acted in the short movie clip along with 129 celebrities and well known faces acting in the movie. This will encourage citizens of the country to make India a better place. As per the sources it is certain that the central government has involved over 18 states to participate in the scheme. States name are : Telangana, Gujarat, Andaman & Nicobar, Rajasthan, Maharashtra, Kerala, Madhya Pradesh, Tamil Nadu, Odisha, Himachal Pradesh, Punjab, UP, Bihar, Chattisgarh, Manipura, Haryana, Meghalaya and Nagaland were involved in the program. The program was organized in 32 distinct locations throughout India. The state government has announced the launch of the Sankalp Se Sidhi Yojana program for implementation. The program stages shall be headed and supervised by MLA Shailendra Jain and Mr. Lakshmi Narayan Yadav on 8th September 2017. The one day program shall be hosted starting from 11 AM onwards. The program shall be organized at Ravindra Bhavan in Jila Mukhyalaya office. State Development and Supervision Committee – A special committee will be formed for the supervision around 3 PM. Request from unemployed Youth – Online applications will be accepted by CM himself depending on the eligibility criteria. Request from the collector – A request regarding Ration shops will be submitted by the state collector. ST/SC category Hostel Issue – As stated by Surendra chaudhary, the enquiry related to ST/SC hostel case is still pending regarding Funds misusage. Satrupa Murder Case enquiry request – Students union request for Resolution of the Satrupa murder care enquiry to proceed and victis to be penalized. Request from School committee – The State government owned school committee made request to Education minister regarding Teachers employment from non government quota. Request from State BJP – A request made to promote Sonu Upadhyay as the state Head for IET Sales. Karam Dev shukla case – A request for enquiry in Karam Dev shukla ATM fraud case for Rs 44987 amount. Request made by Residents of the society Guloa Gupta Garden. The DC (Dy. Commissioner) Arava Rajkamal, on 5th February had looked into the Sankalp Se Siddhi Scheme-2022 Review. The DC also announced to monitor some of the most Backward districts within the state including West Singhbhum. Apart from this he also added that the process of monitoring would be performed using the online platform. Allocation of marks was done for various departments including health (30 percent), associate department (20 percent), education (30 percent), financial (10 percent) and infrastructure (10 percent). Apart from this, he also added that the monitoring process should be carried on regularly by various departments. A complete nation and state level list will also be prepared and submitted. The BJP government is all set to make the Siddhi Campaign a success. Recently, a meeting, where all the leaders came, was organized for charting the future course of this campaign. Abhishek Wadhwa, who is the District President, presided over this meeting as the President and Chief Guest. Apart from the seasoned leader, the younger brigade also took part in this meeting.